As described in Wikipedia, Judaism is the religion, philosophy, and way of life of the Jewish people. A monotheistic religion originating in the Hebrew Bible, Judaism is considered by religious Jews to be the expression of the covenantal relationship God developed with the Children of Israel. Rabbinic Judaism holds that God revealed his laws and commandments to Moses on Mount Sinai in the form of both the Written and Oral Torah. Judaism claims a historical continuity spanning more than 3,000 years. It is one of the oldest monotheistic religions, and the oldest to survive into the present day. The Hebrews / Israelites were already referred to as "Jews" in later books of the Tanakh such as the Book of Esther, with the term Jews replacing the title "Children of Israel". Jews are an ethnoreligious group and include those born Jewish and converts to Judaism. Interesting poll here from the Pew Research Center. You want to hear an example of how great the divide is in America? Listen to this. 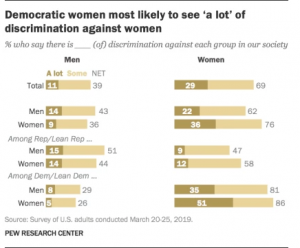 The share in each group who say that women face a lot of discrimination in society, Democrat women, 51% say that. Democrat men, 35%. So 51% Democrat women, 35% Democrat men say women face a lot of discrimination in society. Republican women, 12% say so. Republican men, 9% say so.I don’t know how you can have much better evidence of the divide. 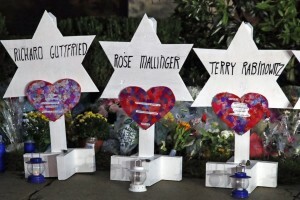 Attackers scapegoat Jews for both hurting and helping Muslims. Pope Francis calls for recognition of Jerusalem as international city. "It is never necessary to censor lies. It is only necessary to censor truth." Why are the Jews so powerful? Isn't anti-Semitism a "hate crime" too?